Preventing sweeping human rights violations or wars and rebuilding societies in their aftermath require an approach encompassing the perspectives of both human rights advocates and practitioners of conflict resolution. While these two groups work to achieve many of the same goals - notably to end violence and loss of life - they often make different assumptions, apply different methods, and operate under different values and institutional constraints. As a result, they may adopt conflicting or even mutually exclusive approaches to the same problem. Eileen F. Babbitt and Ellen L. Lutz have collected groundbreaking essays exploring the relationship between human rights and conflict resolution. 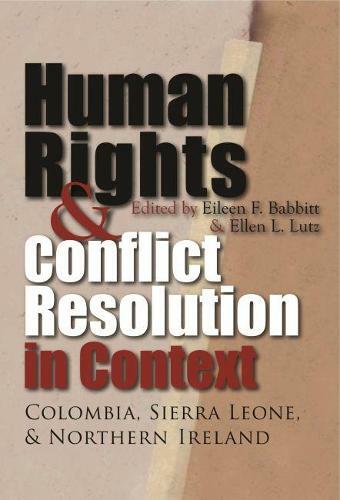 Employing a case study approach, the contributing authors examine three areas of conflict - Sierra Leone, Colombia, and Northern Ireland - from the perspectives of participants in both the peace-making and human rights efforts in each country. By spotlighting the role of activists and reflecting on what was learned in these cases, this volume seeks to push scholars and practitioners of both conflict resolution and human rights to think more creatively about the intersection of these two fields.